Used to cut styrofoam and thermoplastic materials, both freehand and with stencils. The working surface is of aluminium cobond compound. This eases the pushing of work pieces. A printed grid and protractor are applied to the base. Ideal for architectural models, designers, decorators, artists, teaching too, prototypes as well as classical railroad, plane and boat model building. 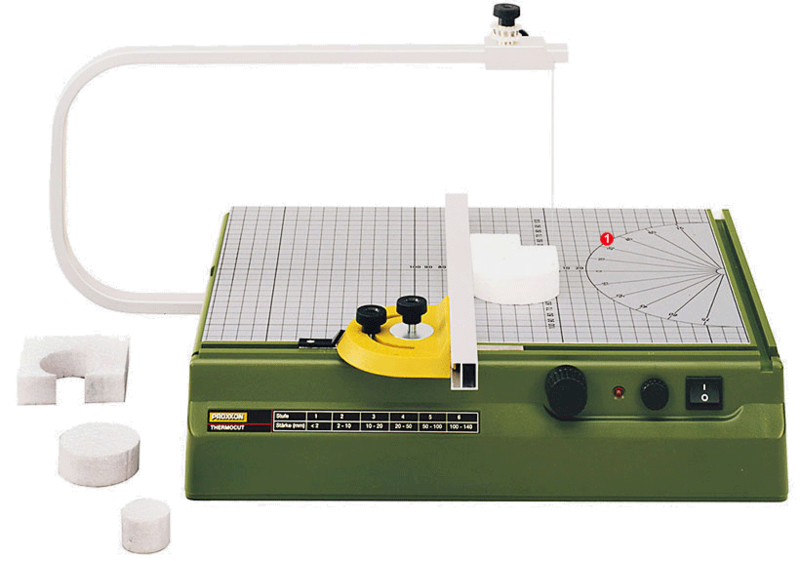 The large base with 390 x 280mm table with surface of aluminium cobond compound ensures smooth and easy movement of the workpiece. 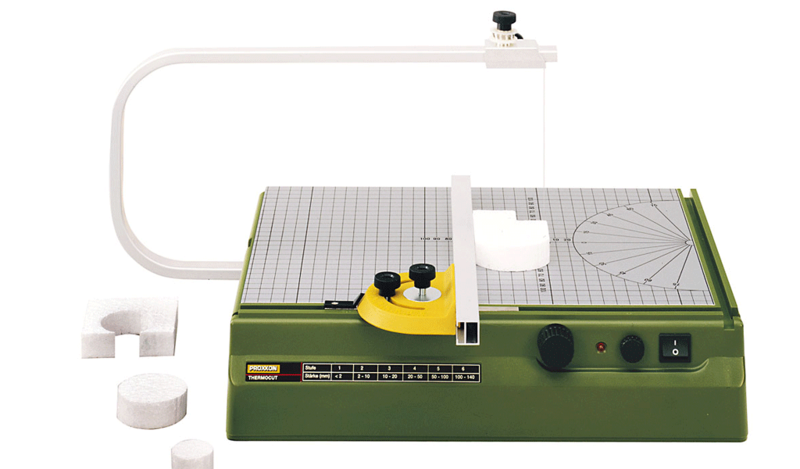 The printed grid and protractor ease division and cutting. The solid aluminium overarm has a 350mm throat and offers 140mm capacity in height. The holder and wire coil (30m, 0.2mm diameter is included) may be shifted along the overarm to enable mitre cutting. A LED indicates operation and prevents burnt fingers (the cutting wire heats to maximum in less than 1 second). The unit's double wound transformer and insulation to class 2 ensure the cutter is absolutely safe. The cutting wire operates at 10V, 1A. 230V, 50/60Hz. Transformer secondary max. 10V, 1A. Cutting wire temperature with 0.2mm diameter is variable between approx. 100 and 200 °C. Weight approx. 3kg. Insulated to class 2 requirements. Used on the THERMOCUT 230/E and other similar units. Made of NiCr 8020. Spool of 30m x 0.2mm. Crosscuts are achieved by means of a simple yet efficient solution: secure drawing-pin to table by means of tape, it serves as a fixed centre. Double function fence with lockable feed bar (German Patent 100 00 102.5). Styrofoam is an inexpensive material and very environmentally friendly as compared to other materials; it can be easily cut through with a hot wire. This material is sold in standard sheet sizes of 50 x 100cm and thicknesses of 2 to 16cm at almost all DIY centres and hardware stores.